On 17 September 1969 Dag Hammarskjöld died in a mysterious plane crash near Ndola in Zambia (the northern Rhodesia). In hindsight the Swede, born in 1905, appears to have been a beacon of light in an otherwise murky morass of international post-war politics. He remains so far the only person to receive the Nobel Peace Prize posthumously- as an upholder of human rights, the initiator of UN-peace troops, an advocate for the Third World during the process of de- colonisation. After the publication of his diary `Markings´, that took the world by storm, professional obituary writers had to re-assess Dag Hammarskjöld's legacy. 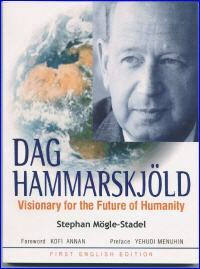 In it Dag Hammarskjöld revealed himself to be a modern day visionary, whose holistic and progressive political vision of a new ethic for humanity formed the basis of all his actions- until he fell victim to an insidious plot designed by western secret services in cahoots with an international mining company with its headquarters in Brussels. Stephan Mögle-Stadel began in 1994 to decipher Hammarskjöld's autobiographical diary "Markings" and his spiritual footsteps. With the help of hitherto unpublished material and conversations with former co-workers he succeeded in unraveling the background of the plot of 1961. He also succeeded in tracing Hammarskjöld's path of inner development, relating to his public offices and activities. A still tangible reminder of these activities is the meditation room in the UN building in New York designed by him and executed by his artist friend Bo Beskow. Stephan Mögle Stadel (1965 - ) is a journalist and publishing consultant. He studied history and psychology and furthered his studies at the C.G. Jung-Institute for Depth-Psychology. He is a member of the Erich Fromm society for Social Psychology. He also worked for a research organisation linked to the Club of Rome from 1996 to 1998. In 1990 he was correspondent in New York and a civil servant at the United Nations in 1992. Since 1993 he is chairman of the German section of WFM-International, a Non-Governmental Organization for the establishing of an International Court of Law for Crimes against Humanity (ICC Conference, Rome 1998) among other items. "UN-finished Way - the UN in the 21. Century". 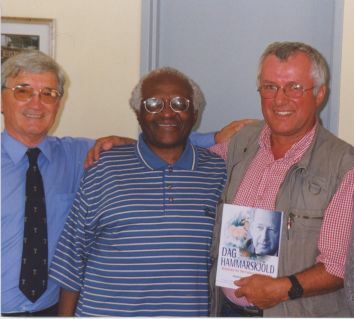 Von Links nach Rechts: Lektor Nick Lee, sowie Friedensnobelpreisträger und Enthüller des Attentats auf Hammarskjöld Erzbischof Desmond Tutu mit dem Übersetzer der englischen Ausgabe Christoph Jensen. "Your book involved political as well as spiritual force." DESMOND TUTU, Archbishop and bearer of the Nobel Prize for peace. "This book is like a voyage to a sunken continent, carrying the name Dag Hammarskjöld." DR. THOR HEYERDAL, archaeologist and author. 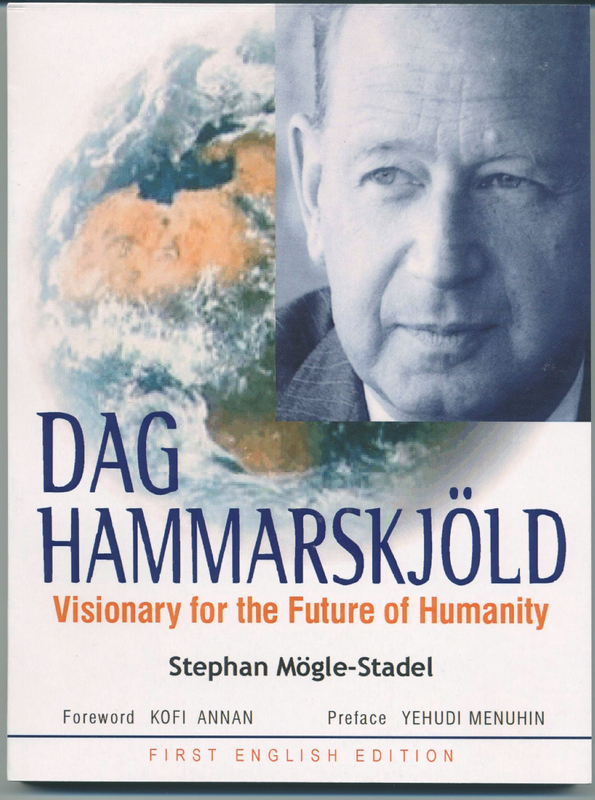 "Dag Hammarskjold's stands out. He had the power to evoke a vision. We remember him vividly because he kept the spirit of the Charter alive in the darkest times." "His accomplishments, his innovations, and his vision are a great inspiration... to uphold the standards he put into place." What is clear is that his core ideas remain highly relevant in this new international context." KOFI ANNAN - Secretary-General of the UN. "Dear Friend, I was very moved by the manuscript about Dag Hammarskjöld. ... We have to overcome Nationalism in all its forms. Nationalism is unable to solve any problems; it is the problem - it poisons the human heart of the people." "There are persons in international administration who believe that this book should be impounded." DR. ROBERT MULLER - former UN Assistant Secretary General. "Who knows what a statesman should look like, a statesman neither exisiting between nor within but above the nations. We are familiar with the national statesman and also with the cosmopolitan, but we do not know the cosmopolitician." GÖSTA VON UEXKÜLL - Journalist and writer, published in the German weekly newspaper DIE ZEIT, 15. November 1956.